Unfortunately at my house, they don't come around until later in the afternoon. I have to wait aaaalllll daaaayyy for them to show up! First they arrive in Mom's office. I like to sit in there with her while she works-I'm sure she needs the company. When the sunpuddle appears, I make sure to soak it up! Later, the sunpuddle makes it to the living room. Sometimes I sit in my chair and enjoy the warmth and other times I lay on the floor. Either way is nice, but it's never there long enough. Pretty soon the sunpuddle goes away and it gets dark. I have to wait until the next day to bask again. Oh, what a long weekend it was for me! Mom left early Saturday morning to visit Grandma and Grandpa and she didn't come home until this evening. Vanessa, the sitter, came by every day to pet and play with me, but it wasn't quite the same as Mom. I had to sleep by myself and only had Dottie to talk to. I thought the weekend would never end! When Mom came home she called Vanessa to get an update on how everything went. Vanessa told Mom that I was a good boy, but she could tell I was lonely. She also told Mom that I was a pig! I'll have to correct her and point out that Dottie is the guinea pig, I simply ate a lot while Mom was gone because I didn't have anything else to do. I've tried to fill Mom in on everything that happened while she was away. I've also told her that she doesn't need to take trips like that. Grandma and Grandpa can just come here to visit if she wants to see them. That way they can see me too! Now I have to snuggle with Mom. I'm sure she missed having me to cuddle with as much as I missed her. Yesterday, Mom's friend Vanessa came over. She has been here before and is very nice. She talks to me and pets me and laughs at me when I act silly. This visit was different though. She wasn't here just to hang out, but to learn how to take care of me and my sisfur, Dottie. Mom is going to visit my Grandma and Grandpa this weekend, so Vanessa is going to check on us while she's gone. I'm a little nervous about Mom being gone for the weekend. I'm afraid it's going to be lonely without her. I won't have her to snuggle with when we go to bed or be able to sit on her lap at the computer. She says it will be okay and that she'll be back on Monday, but it's going to feel like a long, long time. She is making me wear my collar, too. She said it's for my safety, in case anything were to happen, but I don't like having it on. It jingles and rubs on me. I keep trying to bite the tags off, but it's not working very well. Dottie doesn't seem to be bothered by Mom leaving. She acts like she hasn't even given it a second thought. Maybe I just think too much. I hope Mom has a good time on her visit, but I can't wait for her to come home. She hasn't even left yet and I miss her already. Do you remember those C.S. Lewis books? The ones where the kids went into the wardrobe and found that amazing other world? I'm pretty sure there's something similar in the closets where I live. I just have to get in there to find out! There are two closets at home. Mom keeps them both closed off, but she goes into them sometimes. When I hear the door open, I come running, dropping whatever I am doing. It doesn't matter if I'm playing with a mousie, nomming on my kibble or enjoying a sunpuddle. I want to be there when that door is open! Most of the time Mom says, "No, Sebastian. You have to stay out." She'll push me away or turn me around. Sometimes she picks me up and puts me on the bed before she goes back to what she's doing in there. I'm not sure if she doesn't know about the secrets the closets hold, or if she is just too busy to pay attention. Sometimes, I'm able to get in the closet before Mom notices. That always feels so exciting! I sniff everything that I can and peek into all the crevices. I'll even curl up in the corner and wait for something to happen. Before it does, though, Mom is shooing me out, telling me "closets aren't for kitties." Clearly she is mistaken! One day, Mom was working back and forth in both closets and she left one of the doors open. This was a prime opportunity for me! I did my usual once-over of the closet before finding my way on top of a cozy shoe cabinet. What a wonderful spot! I just knew that was a place where I could sit quietly and do some deep kitty thinking. Mom found me, but didn't make me move. In fact, she took a picture of me; it's the picture I use for my profile here. I sat there for a while watching Mom work and contemplating what I could write about and if the super-secret closet-world would open up to me. Unfortunately, it never did. But that doesn't mean it isn't there. I just have to keep trying to get back in there and looking for my own Narnia. One day, she'll open the door and forget about me getting in the closet. I'll have my chance to discover what the closet holds. Any ideas? This is my little part of Be The Change. If you're not familiar with Be The Change, check out either blogpaws.com, pawcuious.com, my Mom's blog, bosoxamy.blogspot.com or you can search #bethechange on Twitter. Go ahead, I'll wait. Great, I'm glad you came back. As you know, I was adopted from Wayside Waifs back in February. I felt so lucky to meet my Mom there. She was a volunteer who came to cuddle with me. I felt bad for all the other animals who had to stay behind while I got to go to my forever home. I am going to take this opportunity to introduce you to some of the animals who are still there. Mom went to volunteer on Wednesday and I asked her to take some pictures for me. Check out some of the cute critters who are waiting for their forever homes! The slideshow from my Picasa album is playing on the right hand side of the page. If you see somebody you want to adopt, go to waysidewaifs.org to see if the pet is still available. If you aren't in the market for an addition to your family, maybe you can make a donation instead. 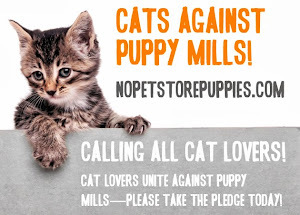 Be The Change is supporting Pets Without Parents. You can donate from the widget on my page. It's right above the slideshow. Thanks for stopping by and remember to be the change you want to see in the world! Oh, what a bad, bad day it was for me today. I didn't realize what was going to happen to me when I got up this morning, but boy, was it scary! First of all, I was very hungry this morning. I didn't think much about it last night when I went to bed, but my food bowl was not in its usual spot by my drinking fountain. When Mom and I got up this morning, I was going to have some brekkie, but the kibble was not there. I followed Mom around while she was getting ready, thinking she would surely be headed to the kitchen to fill up my dish very soon. I meowed at her, just in case she forgot, but that didn't work either. She just said to me, "Sorry Seabass. I know you're hungry, but you can't eat yet." She didn't explain any further than that. Very quickly, Mom was ready for the day. Instead of opening the door to her office and going to work, she went to the living room. I followed her (still thinking I would get something to eat) and she put my collar on me. I never wear my collar while I'm at home, so this was very unusual. Then, she got my carrier and opened it up. I didn't like where this was headed, so I wasn't exactly cooperative when she put it in front of me. I didn't fight too much-I don't want to be a bad kitty-but she knew I didn't want to go in. When I did go in the carrier, Mom zipped it up and said we were going for a ride. Mom carried me downstairs and out to the SUV. She put me in the back seat and strapped my carrier in with the seat belt. She got in, started the car and pulled out of the carport. She said, "We're going for a drive, but don't worry, you'll be back home this evening. Everything will be okay." At that point all I knew was that I was very hungry. I thought Mom needed a reminder, so I told her about it for most of our trip. Finally, we got to where we were going. Mom got out, came around to my door and unbuckled my carrier. When she pulled me out of the SUV, I couldn't believe my eyes! We were back at Wayside Waifs, the shelter where I met Mom. She told me again that I would be back home with her later that day, but I was really scared! We went inside where a nice man took me away from Mom. His name was Dr. Pickett. He was very gentle with me and had a very soothing voice. He said something about "a dental" and some other nice things to Mom. I heard him tell her she could pick me up later and she said she would get me after she was done with her volunteer duties that evening. Then she was gone. He took me to the back where the V-E-T clinic is. The rest is a blur. I was put in a kennel with my carrier. They gave me something that made me very sleepy. The next thing I knew, I was in the kennel next to my carrier covered with a blanket. I'm not sure how much time had passed. There were strangers all around and I felt dizzy. At one point, Mom appeared. Oh, I was so happy to see her, but I couldn't purr to let her know. She was there with another nice lady I knew from my time as a shelter kitty, my adoption counselor, Sharon. Mom told me she loved me and that we would go home soon. She told me to sleep for a while and she would see me later. Some more time passed. Mom and Sharon came back, this time I was able to focus a little better. They opened up my kennel and both petted me. It was so nice to feel Mom stroking my fur. I felt reassured that it really would be okay. Then they closed the door and left again. Later on, Mom came back and this time I got to leave with her. We got in the SUV and headed home. When we got back to the apartment, Mom put my carrier on the floor and opened it up. I was so happy to be back in my own place. I stepped out of the carrier and wobbled. I was still woozy. I walked around and sniffed out my favorite spots. It was all still there! I looked for my food bowl, but it wasn't there. Mom saw me looking and told me I couldn't eat yet. I have never been so hungry in my life! Since I couldn't eat, I just laid down in front of the big door and looked outside. Finally, Mom said I was looking steadier and let me have a few bites of kibble. She told me I could only have a little, but when I was feeling more like myself, she would put the whole bowl back in its spot. She explained to me that I had my teeth cleaned and polished. She said that I had to have my teeth looked after so that they would last for a long time. After getting some food in my empty tummy, I curled up on Mom's lap. I felt so much better than I did when she first came to see me. I was still not completely normal; I was very sleepy and still was not purring. Being cuddled up with Mom helped though. As I write this now, things still feel a little fuzzy. The only thing I can really say about my day is, even with a very nice doctor, going to the V-E-T is no fun at all! Be very concerned if your food bowl disappears. It could be a sign that the same thing will happen to you. Hello! My name is Sebastian. I thought I would take this opportunity to tell you a little about myself. I'm a senior kitty who was recently adopted and am now living in my new forever home. My mom and I met while she was volunteering at the shelter I was at. She came into the hug room I was living in and sat down on the floor with me. I knew right away that I liked her, so I climbed onto her lap and laid down. She petted me for a very long time while I purred away. Two days later, she came back and told me I was going home with her! What a wonderful surprise! Living here has been wonderful. I have a sisfur, Dottie, who is a guinea pig. She has been very sweet to me. She introduced me to Twitter and all of her anipals on there. I thought it was very nice of her to share her Twitter time with me. I try to always let her go first, since she is the Queen around here. I figure it's only fair. When I first moved in, I had some tummy issues. Every other day, Mom would give me treats and I would throw up soon after eating them. Mom was very understanding. While she was cleaning it up one time, she saw me watching her. I felt bad that Mom was working so hard on the carpet because of a mess I had made. She could tell that I was feeling ashamed and sad. She just looked at me and said, "It's okay, Sebastian. I know it was an accident. I'm sorry your tummy is icky." I couldn't believe it! I thought she must be the nicest person in the world to not be mad over the mess on the carpet. I realized right then that she was a great human and that I wanted to be the best kitty in the world so she wouldn't give me away like my last humans had. I worried a lot about being sent back to the shelter. I would cuddle with Mom and purr as loudly as I could to make her think I was a good kitty. One night, I got on Mom's lap while she was in bed. I looked at her and tried my best to make her understand what I was feeling. Somehow, she understood! She said to me, "Don't worry, Sebastian. This is your forever home now. You're safe and will live with me from now on." Then she kissed me and hugged me and we cuddled for a long time. I felt so relieved! Soon, Mom took me to my first visit with my new V-E-T. Mom explained the tummy issues I was having. The V-E-T said I have a sensitive stomach and needed to be on special food. Mom went right over after our visit and bought me the new food. She said it only makes sense that I have a sensitive stomach, since I also have a sensitive soul. It's like she has known me forever. I think we are meant to be together. I just wish I would have met her sooner. Mom thought that since I seemed to be able to convey my feelings to her so easily, that I should have my own outlet for my thoughts, ideas and stories. She said that I could have my own blog, so here I am! I hope to meet lots of new anipals on here in addition to the ones I already have on Twitter. Feel free to post comments or questions. I hope that you find my adventures and activities interesting and that they inspire you to have some adventures of your own. 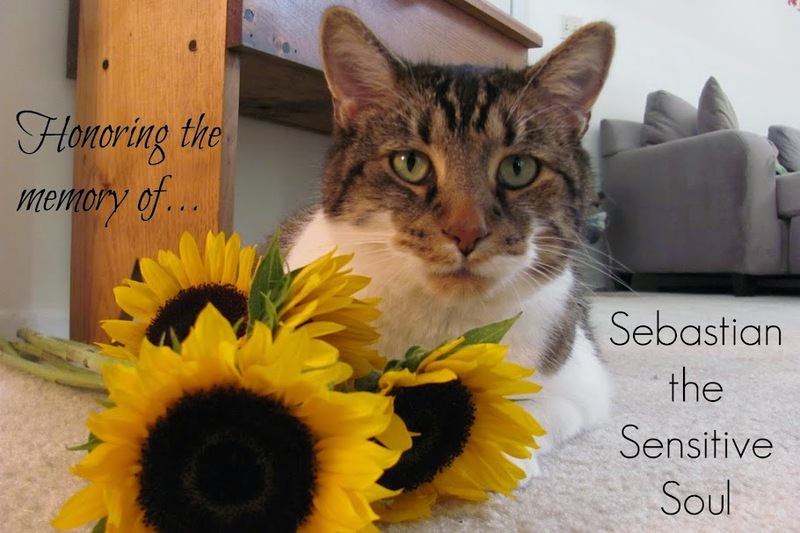 Welcome to Sebastian The Sensitive Soul!